This recipe is fun to make, and it's a good sensory activity for kids (they get to touch different foods and textures from smooth to sticky to crunchy). The kids can make it together with a friend or sibling. Encourage them to experiment with different spreads and toppings and get creative. It can be a little messy, so keep paper towels nearby for wiping sticky fingers. 1. First, peel each banana. Cut off the end, then peel away the yellow part. Lay the bananas flat on a plate or cutting board. 2. Use a plastic or butter knife to spread a thin coat of nut or seed butter, honey, or yogurt on all sides of each banana. You can coat the fruit on the cutting board or plate or hold it upright with one hand. 3. Now get your toppings ready. Use a rolling pin to crush the apple chips, graham crackers, or corn flakes. Pour the crumbs onto a plate. On a separate plate, place the granola or other cereal. 4. Sprinkle a topping over each banana, turning the fruit until it’s coated on all sides. Gently press the topping with your fingers so it sticks to the nut or seed butter. 5. Cut the bananas into bite-size pieces (about 1 to 2 inches). Trim the ends flat and stand them upright. 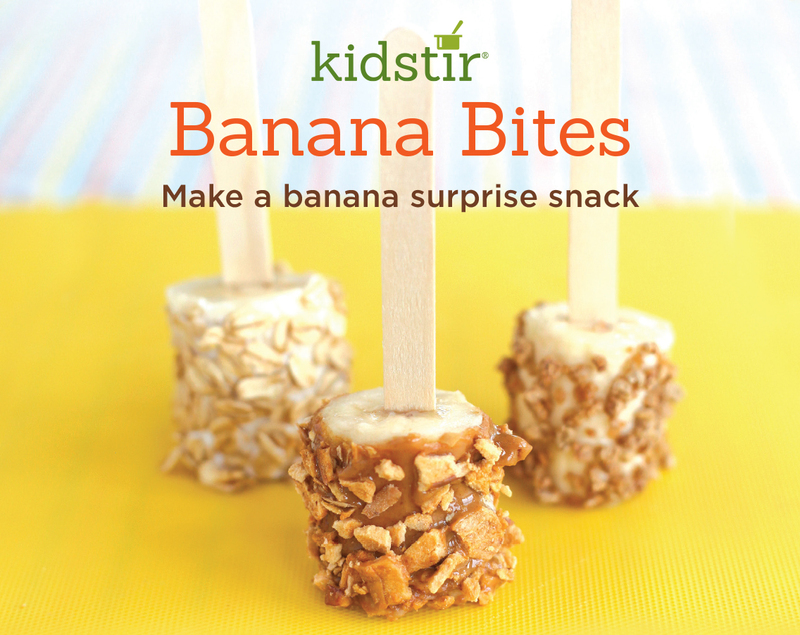 Eat with a fork or add a popsicle stick—like we've done—for more fun!